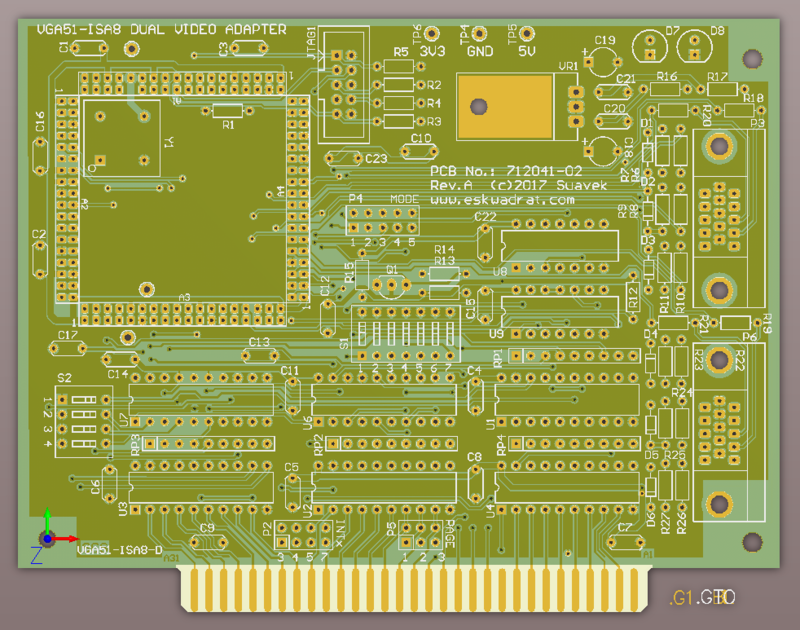 The VGA51 pcb have been ordered using local US based service I rely on for many years which is 4pcb.com. They offer free design fabrication & manufacturing check of your gerbers through FreeDFM page. A $33 or $66 each specials are available for 2-layer and 4-layer boards respectively. Here is an view for the board artwork. Fabricated pcb samples of 1st cut prototype is looking good. Now it is time for final board assembly. 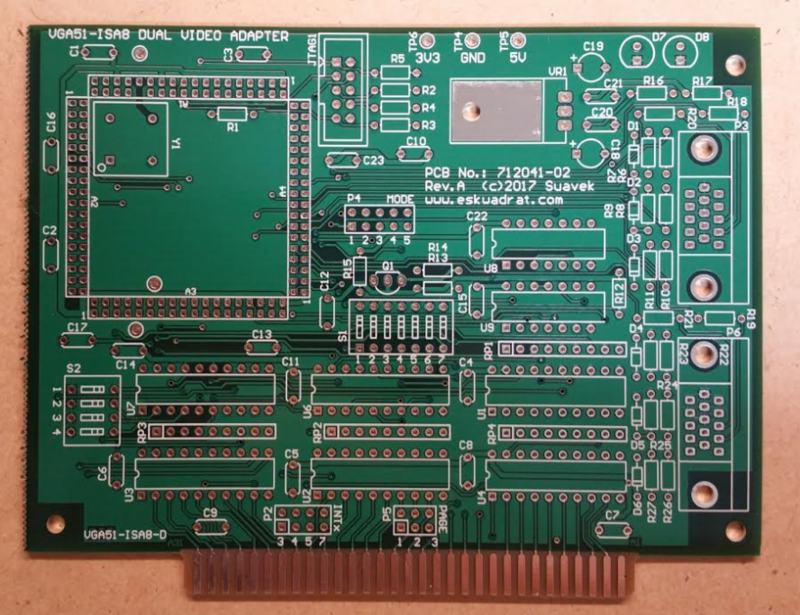 The mezzanine pcb used to carry video FPGA has already chip professionally pre-soldered. 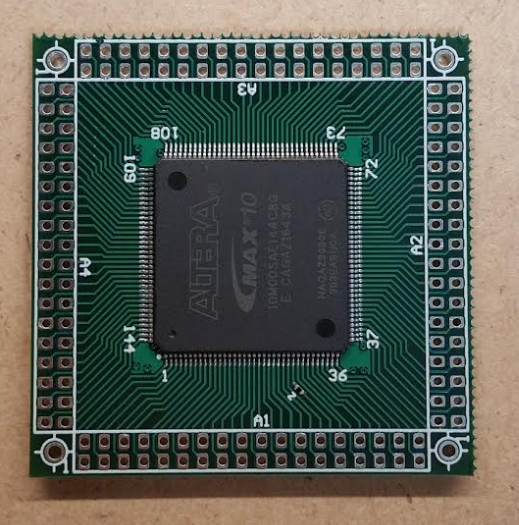 The plan for diy kit is to provide mezzanine boards with soldered FPGA chip and tested to minimize risk of assembly damage. Leaving only through hole components to be soldered for the user makes the kit definitely more diy friendly. This 1st piece has also pre-soldered 50MHz smt oscillator and all recommended decoupling capacitors to minimize EMI and ensure board performance. 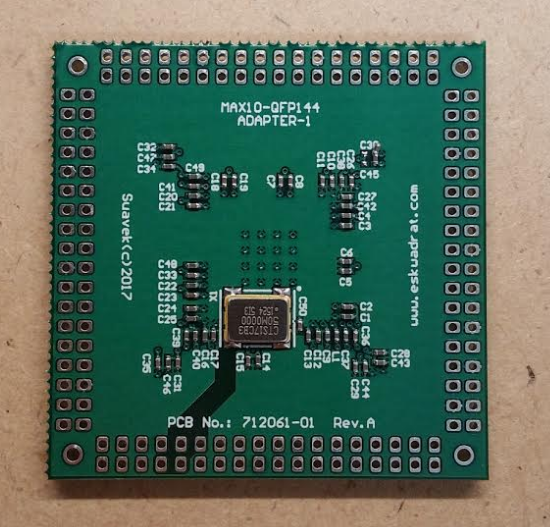 The pcb design allows using either surface mount oscillator pre-installed on mezzanine board, or through hole dip oscillator which user can install on the base board himself. Before I solder any components on the base board, I checked the board fit in the actual PC enclosure w/motherboard installed. This is very important step to ensure the board mechanical dimensions and DSUB connectors location in the design are correct. 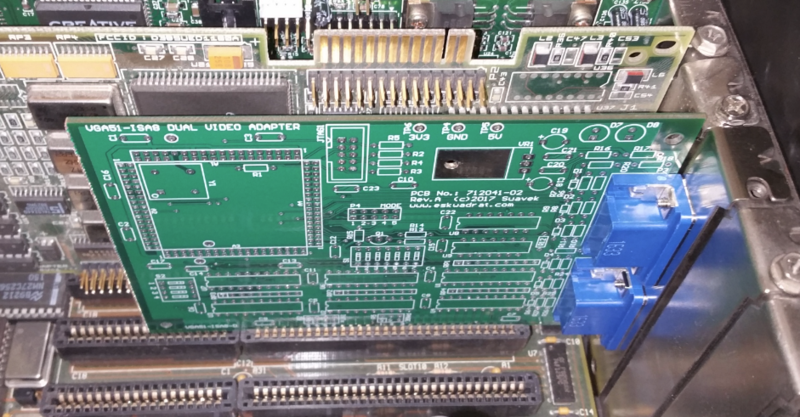 For this verification I have used bare VGA51 board with both DB15HD sockets and metal bracket installed. Inserting board into the PC computer confirms perfect fit of the entire VGA51 pcb with no "pushups" neither gaps between bracket and chassis. 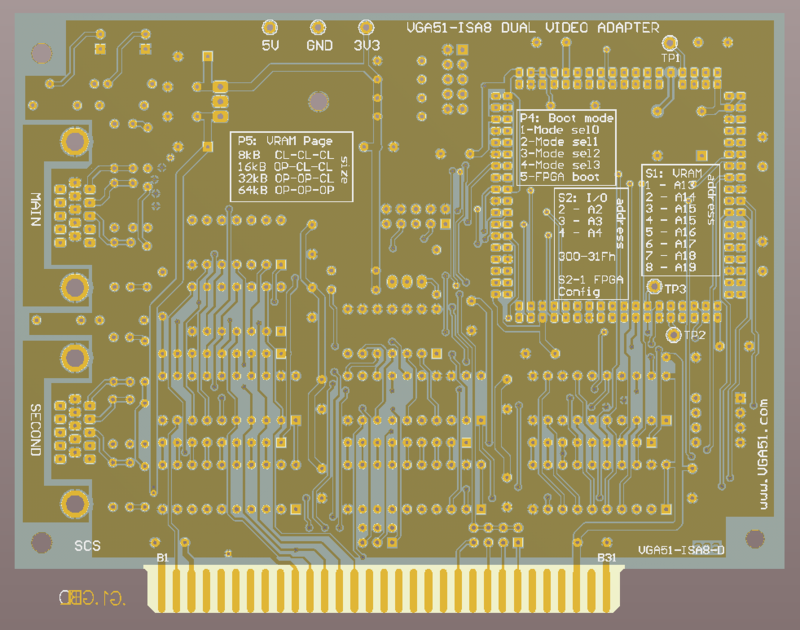 Hence this is a "pass" for the mechanical fit of VGA51 ISA version of the adapter. Note perfect bracket fastening screw slot alignment with the corresponding screw hole in the computer chassis. Even with no screw installed yet. 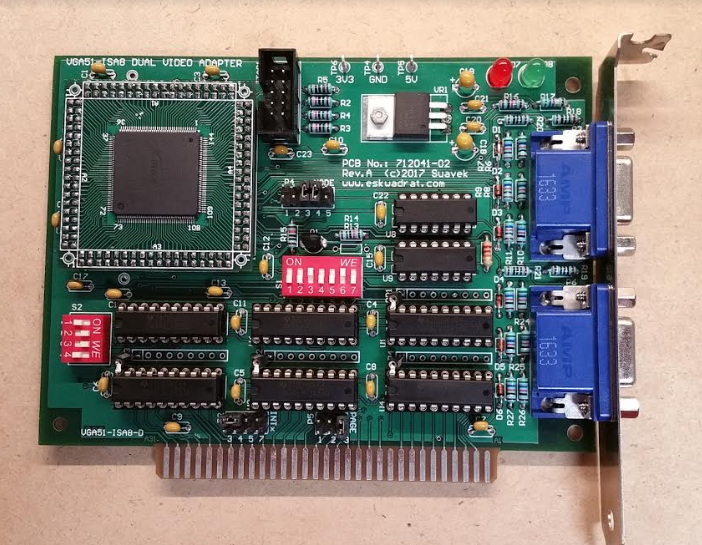 Below is assembled ISA version of the VGA51 prototype. and installed in PC-AT clone running 80286-16MHz CPU for testing. And here it is my old circa '90 AT machine is running two additional monitors. 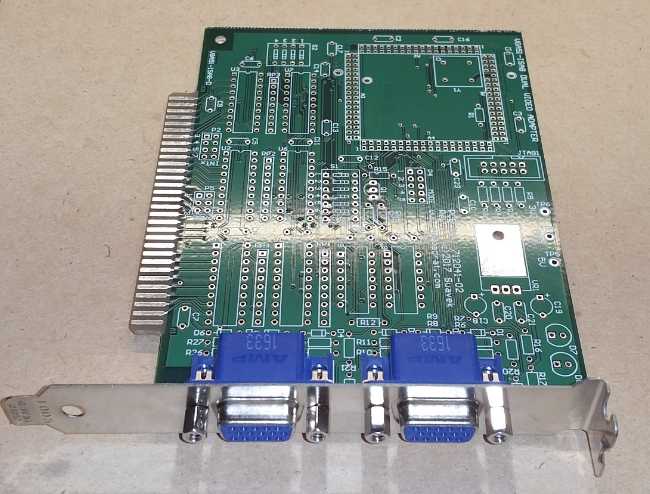 Time to clean up the design and create final version of the VGA51 dual screen graphics adapter.